You know why? Because no matter how detailed my notes were by the time I got home and started my homework, those same notes were like trying to read Chinese. Why the h-ll can’t I remember anything no matter how hard I try?! 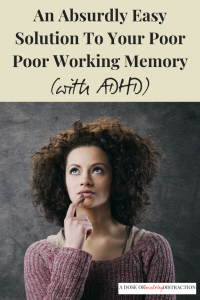 ADHD and…a pretty crappy working memory. Join me in the Society of Poor Working Memory. If my memory is any indication, the period of time ADHD’ers can store information in their brain is relatively short. The same part of the brain responsible for working memory is also responsible for attention and concentration. All of a sudden it is startlingly clear to me that not only do I have ADHD, but my terrible, no good, very bad working memory has been affecting me for my entire life. But there is an simple solution to your poor working memory: it’s called monotasking. I first heard about monotasking from Carla Birnburg. HERE. How had this idea never enetered my consciousness? Everyone with ADHD should be monotasking. Then use a calendar app or Google Calendar to create an auditory reminder system for yourself. My phone makes noises at me five times a day – it’s annoying but it gets the job done. If we concentrate on one thing at a time we are much more likely to make progress. We no longer have to question how we can be more effective at home and at work. The answer to better productivity with ADHD lies in monotasking and understanding how executive functioning is impacted by ADHD. Sign up for my email list – I try to keep it information and inspirational without wasting your time or mine!